WASHINGTON -- Kirby Puckett, the Hall of Fame outfielder who rose from a Chicago housing project to win almost all the honors, accolades, and rewards professional baseball could bestow, died yesterday in a Phoenix hospital, a day after suffering a stroke. He was 45. During 12 seasons in the American League, Mr. Puckett, whose stocky, 5-foot-8-inch frame seemed to radiate power, amassed a career batting average of .318 with the Minnesota Twins and helped lead the team to two world championships. Beyond his prowess as a fearsome righthanded hitter with 207 career home runs and 1,085 runs batted in, Puckett was adroit afield, winning the Gold Glove award six times. Moreover, he was known for projecting a cheerful good nature and infectious enthusiasm for the game that made him one of the most popular figures on the playing field, in the clubhouse, and among baseball fans of the upper Midwest during a career that began in 1984 and continued through the 1995 season. The retinal damage that impaired his sight in one eye and forced him into premature retirement was regarded as a blow to the sport and mourned by fans throughout the nation. In 2001, he was named to the Hall of Fame, taking his place alongside the other great stars of baseball. His image, however, later was tarnished. His marriage broke up amid allegations of infidelity and abuse. In 2002, a woman who said she had an 18-year affair with him obtained a court order in Minneapolis forbidding him from having contact with her. An allegation that he groped a woman in a Minnesota restaurant resulted in a trial in 2003. Mr. Puckett denied the charges, and a jury acquitted him. These matters tested the loyalties of a vast army of fans, many of whom were taken by the accounts of his rise from the humblest of beginnings to the ranks of athletic royalty. He was born in Chicago, the youngest in a family of nine children, and raised in the Robert Taylor Homes, a gritty and notorious housing project on the city's South Side. Too short for basketball, he was kept from football by his mother. That left baseball, and according to an account in the Chicago Tribune, he taught himself to bat by thrashing with a stick at a wadded-up sphere of discarded aluminum foil. After high school, Mr. Puckett entered Bradley University, left, and enrolled at another Illinois school, Triton College. Selected by the Twins in the first round of the 1982 draft, he made his major league debut May 8, 1984, and amassed 165 base hits in 128 games, finishing with an average only 4 points below .300, the gold standard for batters. The next year, he had 199 hits and finished with a .288 average. He finished below .300 only two more times in the next 10 years. In one of those years, 1988, he finished with 234 hits and an average of .356. In 1989, he led the league in batting with .339. His plaque in the Hall of Fame in Cooperstown, N.Y., describes him as ''a proven team leader with an ever-present smile and infectious exuberance." As a defensive standout, it says, he roamed center field ''with elegance and style and would as a matter of routine scale the walls of the outfield to catch opponents' drives, often robbing them of home runs." As the Twins' general manager in 1989, Andy MacPhail signed Mr. Puckett to a $3 million a year contract, then one of the highest in baseball. 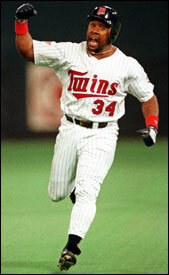 Last night he told the Chicago Tribune that Puckett was ''probably the greatest teammate I've ever been around." ''You always felt better when you were around Kirby," MacPhail told the newspaper. ''He would tease anybody -- he would tease me, whoever. He just had that way about him." ''He was a Hall of Famer in every sense of the term," baseball commissioner Bud Selig said in a statement. ''He was revered throughout the country and will be remembered wherever the game is played." According to the Tribune, Puckett recently had moved to Scottsdale, Ariz. He had soared from a playing weight of 210 pounds to 300 and was trying to shed the excess. But, a friend told the newspaper, ''he enjoyed life and enjoyed the size he was."